Not a palm, Gymnosperm, Grows to 5' - 10' high x 6' wide, entryways, atriums, small scale rock gardens, bonsai coarse textured trunk, refined look. Blumes in late spring into early summer large cone 18 - 20' cream flower alternate years. 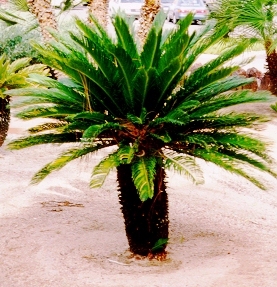 Low maintenance, trim old fronds in spring, plant when frost danger is past. Dark green foliage, stiff & sharp.